This is our third post in our Investing 101 series. See the whole series here. 51 percent of Americans didn’t save for retirement in 2014 and missed out on the fourth longest bull market run in history. The reason most of this 51 percent didn’t invest was because they didn’t know enough about investing. With this series, we hope to help fix that. So far, we’ve discussed stocks and mutual funds. This week, we’ll discuss exchange traded funds, better known as ETFs. Next week we’ll discuss bonds. ETFs comprise of some characteristics of stocks and some characteristics of mutual funds. They work similar to mutual funds and trade like stocks. Similar to mutual funds, ETFs are baskets of other investments pooled together to create a unique investment. This pool of investments can consist of stocks, bonds, commodities and other investment types. Unlike mutual funds that trade daily after market close, ETFs are traded throughout the day and their prices adjusted in real-time like stocks. Also like stocks and unlike mutual funds, ETFs can be sold short and purchased on margin. 2. What Types of ETFs Are There? The most prolific types of ETFs track narrow market indices, such as the S&P 500 for large cap stocks and the Russell 2000 for small cap stocks. There are other ETFs that track broader indices with various investment objectives, such as international growth, technology and many others. 3. What Are the Rewards and Risks of Owning an ETF? The rewards of owning ETFs is that they are tax advantageous, easily provide diversification and have lower fees. Most ETF gains are reinvested back into the ETF and avoid a taxable event. As with mutual funds, because ETFs comprise of many investments, they easily allow for diversification. This diversification reduces an investors risk of “having all eggs in one basket” and positions them to take advantage of the gains that are available in the market. Lastly, because most ETFs track an index, they don’t require active management. Because of the lower requirement for active management, ETFs don’t carry the high fees that some mutual funds do. 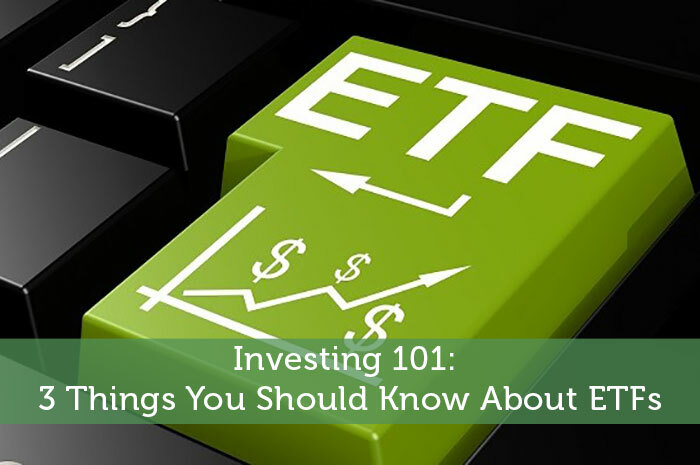 An investor can, however, increase their cost of ETF ownership through excessive transaction fees or commissions if they frequently trade their ETFs. Such excessive trading can increase their taxes of these transactions aren’t done in a tax sheltered retirement account. Even though ETFs provide diversification, they do have a more narrow focus than some mutual funds. In fact, some ETF niches are so narrow in focus that they lack liquidity. This means that there aren’t a lot of buyers and sellers. For example, there are many more investors buying and selling Apple Corporation stock than there are for Weibo Corporation stock. Though most everyday investor wouldn’t likely notice, this makes buying and selling some ETFs harder. That’s what you need to know about ETFs. With this basic understanding now of stocks, mutual funds and ETFs, you have a greater knowledge of investment types than most Americans. Next week, we’ll discuss bonds. That flash crash back in Aug 2015 with the Vanguard ETFs really scared me. Made me decide that I don’t like indvidual investors using them by themselves. I think it’s great for financial advisors but wouldn’t want your average mom and pop buying and selling them.